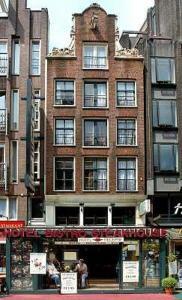 Hotel De Korenaer, Amsterdam discount hotels and accommodation. Hotel 'De Korenaer' is a typical Dutch three star hotel, centrally located on Damrak, Amsterdam’s main avenue and close to many attractions. Straight across the street there is a dock, from which you can tour the famous canals by boat. Within walking distance you'll find the Dam, the flower market and the famous Rembrandtplein with all its pubs and clubs. By tram you can reach all the 'well known' museums and attractions, such as the Anne Frank house, Heineken Brewery and the “Artis” Zoo, within five to ten minutes. View photos, room descriptions and make online reservations at Hotel De Korenaer. Save on room prices at Hotel De Korenaer, Amsterdam.